Progress in the development of bioprocessing-related assays and analytical instrumentation has not kept up with industry demands. The industry wants analytical technologies (especially for single use) to help improve productivity, optimize and monitor processes, provide real-time product quality control, and characterize biosimilars. These trends are reflected in our recent survey data. Over 30% of biopharmaceutical manufacturers and contract manufacturing organizations (CMOs) have expressed demands for improved assays and analytical equipment (1). BioPlan Associates’ eighth annual survey of biopharmaceutical manufacturers (with 352 global respondents) shows that, second only to single-use/disposable bioprocessing equipment, the industry is asking for new, improved, more relevant and cost-effective assays and analytical instruments. In particular, this need is felt most acutely among CMOs that use a lot of disposables — and that often requires greater process control to ensure cost management for their clients. Selected data from the study show increasing industry interest in assays and analytical equipment among both contractors and biomanufacturers (Figure 1). The latest survey data show that the industry is specifically looking for new product developments related to analytical assay technologies that will support improved processes and productivity. Topics of interest include better probes and sensors, in-house real-time analyses of process streams, use of biological assays to determine active-agent–related quality (e.g., glycosylation variants), and outsourcing of specialized chemical analysis and biological assays. Good process- and product-related data are widely recognized as supporting consistent biomanufacturing. That can permit benchmarking for improved product quality and reduced costs. And improvements in assays might also make it easier to satisfy regulatory agency expectations. Across the board, responses from both product developers and CMOs indicate that increasing productivity pressures are forcing the industry to do more with less. Associated with this trend are growing demands from regulatory agencies for more and better quality-related documentation. Product and process reviewers want to see evidence that assays and analytical data are used to guide bioprocess design and scale-up throughout development from the beginning. Analytical assays and their integration into product manufacturing will improve bioprocessing productivity and quality. 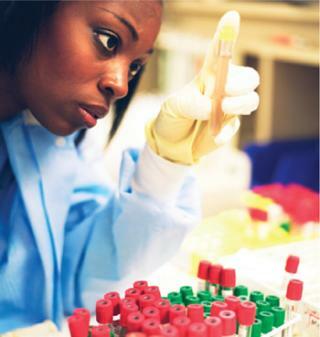 Survey results identified trends pushing for better assays and analysis. Advancing single-use technologies are a major driving force, as are industry expectations for more extensive analytical information. Industry expansion — much of it driven by the global emergence of biosimilars (and biogenerics and biobetters) — is also driving the need for assays and analytical equipment, with approvals for such generic-like products largely depending on comparative analytical data. The need for better assays is creating acute problems in production as well, as confirmed by additional survey data. For example, 26.2% of respondents cited “analytical testing and drug product release” as a major factor likely to constrain their organizations’ production capacity over the next five years. 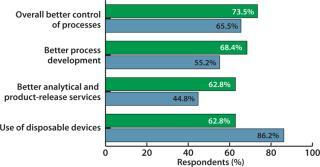 Similarly, when asked about complementary issues involving process improvements, among 15 topics questioned, the largest portion (73.5% of biomanufacturers and 65.5% of CMOs) cited “overall better control of the process” as providing the greatest potential improvements in bioprocessing. Further, about 61% of respondents cited “better analytical testing and release services” as responsible for improved performance (Figure 2). Analytical techniques can create improvements in process control and optimization. With introduction of single-use/disposable bioprocessing equipment (especially among CMOs), better testing can prevent lost staff time and delays in product development. It can also support greater regulatory oversight, as well. The survey data also clearly show that the bioindustry sees a need for improved analytical and product-release services, automated process control, and implementation of formal quality improvement programs such as quality by design (QbD), process analytical technology (PAT), and six sigma. improved testing technologies are urgently required. The largest portion, well over 40%, cited glycosylation and comparability testing (primarily for demonstrating comparability among lots and batches of the same product, and also to show biosimilarity). CMOs are most interested in such improvements. With glycosylation concerns largely restricted to mammalian cell culture, that suggests industry demand for improvements in such processes. 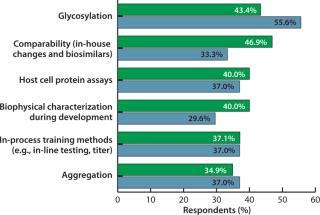 Further, ~40% of all respondents cited the need for improved host-cell protein assays, biophysical characterization during process development, in-process testing, and aggregation assays. The survey showed differences between the responses of in-house product manufacturers and CMOs. Biomanufacturers tend to focus on active agent comparability (in-house manufacturing changes and biosimilarity), biophysical characterization during process development, and stability assays. CMOs tend to be more concerned with glycosylation, precalibrated disposable sensors and pH disposables, and quantitative real-time polymerase chain reaction (qPCR) testing. Nearly half (48%) of US respondents and 37% of Europeans indicated that “biotech drug comparability (in-house manufacturing changes and biosimilars)” was their top concern, whereas more Europeans (51%) ranked glycosylation as number one (42% in the United States). Formal product quality assurance and improvement programs are being prompted by requests for increased documentation from the FDA, EMA, and other organizations. A need for more data on quality throughout product and process development and manufacturing is fostering adoption of additional assays and analytical testing. PAT, QbD, and other measurement-based quality programs are efforts to better quantify, model, and understand biomanufacturing processes and their effects on products. The underlying presumption is that quality can and should be built into a product through full understanding of it and the processes by which it is developed and manufactured. Up-front planning, data-, and information-based approaches are replacing classic approaches using quality control (QC) testing, especially after design and manufacture. In many respects, these new initiatives involve no specific additional requirements beyond current good manufacturing practice (CGMP) standards, but these programs put more emphasis on planning and analysis within a rigorous framework. Although adoption of such formal programs has been relatively slow, the industry can be expected to increase its use of PAT and improved analytical methods. Such methods can improve productivity, increase yields and automation, and especially help companies prevent potentially costly quality-associated problems. But improved analytical technologies are needed by companies seeking to optimize their process monitoring. In particular, as more single-use devices are implemented in GMP operations, disposable sensors and probes will need to be integrated as well. Resulting data will increasingly be used to benchmark productivity and support mathematical modeling and risk analysis both within companies and by regulators. The biopharmaceutical industry is set for a major expansion (2). More than 150 follow-on recombinant proteins and antibody products could be marketed in the United States (where a biosimilar approval pathway is in progress) and elsewhere. Already, the European Union and other countries have regulatory mechanisms in place (3). Most current major biopharmaceutical products will be losing their patent protection over the coming years, and 5–10 or even more biosimilar (including biobetter and biogeneric) versions of each successful product are expected to enter major markets. So the overall number of biopharmaceutical manufacturers and facilities could increase over time — even as consolidation and economic factors suggest otherwise. This eighth in the series of annual evaluations by BioPlan Associates, Inc. yields a composite view and trend analysis from 352 responsible individuals at biopharmaceutical manufacturers and CMOs in 31 countries. The methodology also encompassed an additional 186 direct suppliers (vendors) of materials, services, and equipment to this industry. The latest survey covers such issues as current capacity, future capacity constraints, expansions, use of disposables, trends and budgets in disposables, trends in downstream purification, quality management and control, hiring issues, employment, and training. Quantitative trend analysis provides details and comparisons of both biotherapeutic developers and CMOs, evaluating trends over time and assessing differences in the world’s major markets: Europe and the United States. Better analytical testing should enable more biosimilar approvals, as illustrated in a recent article by FDA staff concerning the agency’s implementation of biosimilar regulations (4). For generic-like approvals, the FDA and other regulatory agencies will largely rely on analytical data to support conclusions that biosimilar candidates are sufficiently similar to their marketed reference products. The authors noted that “it seems possible to exceed a current state-of-the-art analytic characterization by evaluating more attributes and combinations of attributes at greater sensitivities with multiple complementary methods. There may be strategies that allow a ‘fingerprint’-like identification of very similar patterns in two different products” (4). With sufficient advanced technologies, companies will rely on comparative analytical data to support their biosimilar approvals. For those drug developers, analytical testing would be much less expensive (and quicker to develop) than relying on clinical trials alone to support their product approvals. Eric S. Langer is president and managing partner at BioPlan Associates, Inc., a Rockville, MD-based biotechnology and life sciences marketing research and publishing firm established in 1989. He can be reached at elanger@bioplanassociates.com or 1-301-921-5979. 1.) Langer, ES 2011.Eighth Annual Report and Survey of Biopharmaceutical Manufacturing Capacity and Production, BioPlan Associates, Rockville. 3.) Konski, A. 2011. Generic Biologics: A Comparative Analysis of Regulatory Review. BioProcess Int 9:34-41. 4.) Koslowski, S. 2011. Developing the Nation’s Biosimilars Program. New Eng. J. Med www.nejm.org/doi/full/10.1056/NEJMp1107285 365:385-388.